Programmable control Image size, gain, Exposure time, trigger polarity, flash polarity etc. The I/O connector from a USB camera is an 8 pin HR25 Hirose connector, which is a standard in the industrial machine vision market. This camera has an input that can be used as a hardware trigger for the device. The output of the camera can be used to trigger a light source, for example: LED. Furthermore, the camera has two GPIO’s (General Purpose Input/ Output) which can be programmed by using our SDK. The electrical diagrams to use the I/O connector are provided in the manual. 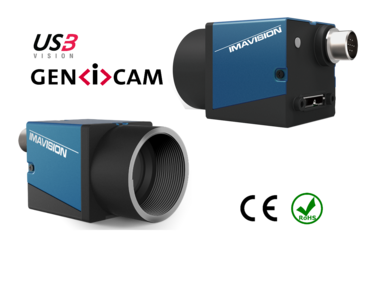 This 1/3-inch format, 1.2 MP imaging device has been designed to address the challenging requirements of automotive in-cabin cameras. The new global shutter sensor allows the camera to “freeze” fast moving scene data, and ensures effective synchronization with pulsed light sources. The AR0135 sensor incorporates a new innovative global shutter pixel design, with 10X lower dark current and 4X higher shutter efficiency vs. previous generation products. 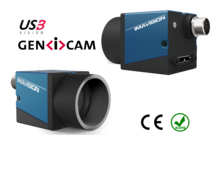 These improvements allow the sensor to produce clear, low-noise images, in both low-light and bright scenes, and in high temperature environments. This performance enables the required eye tracking and gesture detection functionality in next generation automotive in-cabin systems. Features: ON Semiconductor's Next Generation Global Shutter Technology, Superior Low-light Performance, HD Video (720p60), Video/Single Frame Mode, Flexible Row-skip Modes, On-chip AE and Statistics Engine, Parallel and Serial Output.